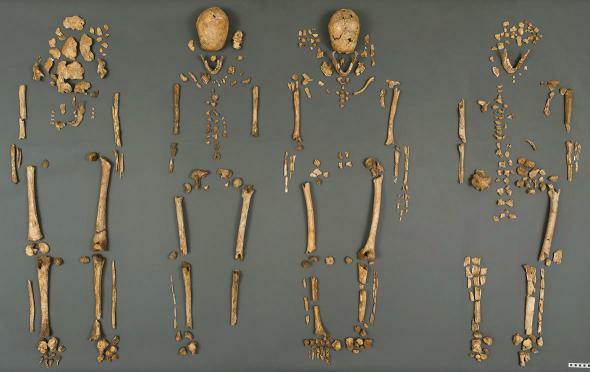 Jamestown archaeologist Kelso and historian Horn: Public reaction to four bodies and silver box. A team of scientists recently announced the identities of Rev. Robert Hunt, Capt. Gabriel Archer, Sir Ferdinando Wainman, and Capt. William West, high-status leaders who helped shape the future of America during the initial phase of the Jamestown colony. They had four bodies and several dozen possible names. For archaeologist Bill Kelso and historian James Horn, it felt like a high-stakes game of Clue. The mystery was set in Jamestown, Virginia, on the grounds of the first permanent English colony in America. 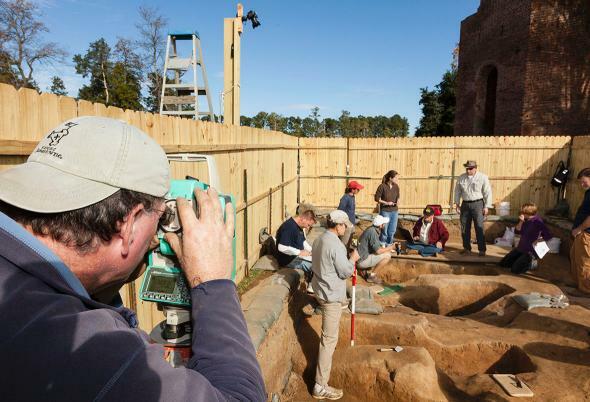 Jamestown is a strange place to be an archaeologist. It’s a popular tourist attraction, so vacationers stroll the grounds while researchers work. Any newfound relic, building site, or body has to be kept quiet by everyone who knows about it until researchers complete their work, and in this case, 2,000 people were in on the secret. (I was one of them.) Archaeologists there are constantly making important discoveries about American history—but the public is mostly interested in cannibalism and Pocahontas. Last week came the moment of truth: Would people care about these four mysterious bodies as much as the two men in charge of the hush-hush project wanted them to? The mystery began in 2010, when archaeologists found a series of postholes that formed a rectangle approximately the size of a church. The building had been recorded in historical documents, but until then, no one knew where it had stood. Immediately, researchers had suspicions of who might be buried in the ground nearby. Important people would likely be in the chancel, where, by Protestant tradition, the elite were laid to rest. Before I visited Jamestown, all I knew about a chancel was that it is a legal Scrabble word. At Jamestown I learned that the communion table stood in the chancel, and it was therefore the holiest spot in the church, and only the most important people in the community were buried beneath it. Digital reconstruction of the church. In 2013, the remains of four men were found in the east end of the site, at the front of the chapel. It took two years of painstaking investigations to identify them to 90 percent certainty. There were multiple lines of attack. The team used high-tech CT scans, forensic analyses of the remains, laborious study of artifacts, 3-D technology, and archival research. The records of influential men in the colony were finally narrowed down to four leaders of Jamestown. Before the discovery was announced last week, the names of these four colonists were not well known to anyone but academics and the biggest history buffs. 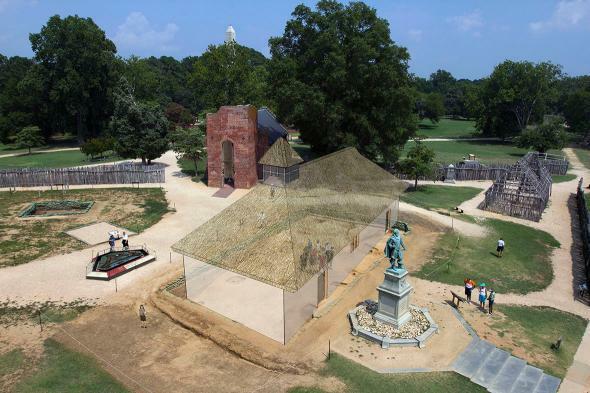 Kelso, the director of archaeology for the Jamestown Rediscovery Foundation at Historic Jamestowne, and Horn, the organization’s president, weren’t sure what sort of impact the news would have. Kelso and Horn knew the men buried in the chancel didn’t include Capt. John Smith, the man many fans think Pocahontas married, or John Rolfe, the man she actually did marry. Smith, who died in 1631, was buried in 1633 in a London church. Rolfe likely died when his tobacco plantation Bermuda Hundred came under surprise attack. During the “Indian massacre of 1622,” 347 colonists, a fourth of the English population at Jamestown, were killed by Powhatan Confederacy warriors. Rolfe’s place of burial remains unknown, but this burial site dated to an earlier time, probably between 1608 and 1610. The four who were found were impressive in their day, though. Capt. Gabriel Archer was an explorer and the rival of the more famous Smith; Archer was discovered in a hexagonal box wider at the shoulder than the head, with a captain’s staff and a silver box. The Rev. Robert Hunt was the first Anglican (Church of England) minister at Jamestown. He arrived with the first settlers and was responsible for providing religious services to the men as well as for preaching to local Native American people. Sir Ferdinando Wainman, in charge of the colony’s horse troops, and Capt. William West, also a military man, were two relatives of Lord De La Warr, a governor sent to Jamestown to save the starving colony. Wainman and West were found in coffins constructed to human dimensions, a fact determined by the pattern of nail remains in the soil—most of the wood was long rotted out. Kelso knew the human-shaped coffins would have taken a true cabinetmaker on the scene and would have taken a lot of time. That suggested these were exclusive burials and pointed to a formal funeral procession, one that was made to be seen. Archaeologists work on the chancel burial excavations. Photo by Michael Lavin. Courtesy of Jamestown Rediscovery Foundation (Preservation Virginia). One of the most intriguing finds was the small hexagonal silver box found on top of Archer’s grave. It contained seven bone fragments and the remains of a small lead vial called an ampulla, and it was engraved with a mysterious letter M. Did this reliquary with its bone fragments, traditionally a type of Catholic relic, point to a secret Catholic cell in the first English Protestant church in America? The vial may very well have held blood, holy water, or oil. Or the vial could have held lost significance in the first religious outpost in the New World by the Church of England. Or was it simply repurposed as an Anglican object? Had the Anglicans still held on to the traditions of Catholicism, hedging their bets? The launch of Jamestown was very close to the time of the Reformation. Archer’s parents at least were Catholics. It was a real puzzle. Could the average American grasp how explosive this was? I learned about the discovery of the bodies more than a year ago, at the Pocahontas wedding ceremony: A gabby young hire had forgotten he was sworn to secrecy. I didn’t write about it then because it wasn’t my story to blurt out, it was unripe, and it wasn’t doing anyone a favor to be the big mouth. And who wants to get a newbie fired, destroy a career? All the people I met were passionately committed to the project, and I was on their team. Every American should be on their team. I was genuinely excited for those involved when the story hit, and I was curious if it would resonate in a nation often portrayed as having a shallow interest in history and science. A press release announcing the discovery came July 28. By afternoon, the reveal from Jamestown was trending in the top stories with Ben Affleck’s divorce and the Zimbabwe lion shot by a Minnesota dentist. Then came the proud coverage from local papers like the Virginian-Pilot. Soon there was a major feature from seemingly every newspaper in the nation, from a heavily promoted piece in the New York Times to the cover of the Houston Chronicle. Across the pond, the British picked it up in their papers and the BBC. Jamestown, the first successful English colony in the Americas, is an important part of British history. So the story was going viral! From New York City, I arranged for a three-way phone interview to see how the main players were getting on. I was so happy for them. Were they happy? Can archaeologists ever be satisfied? Chancel burial excavations, November 2013. My first thought was that it held coins that would date the site. Or maybe there would be a signet ring, which would be great identification. What we had available to work with was almost as exciting. It’s all so crazy, because I started so many years ago walking along the James River with a pen and pencil. Now my team is working with the most powerful CT scan in the world, at the General Electric plant in Pennsylvania, normally used to scan automobile engines. I certainly could never conceive of that kind of technological aid earlier in my career. Did you read about the silk stash adorned with silver fringe we found via CAT scan? 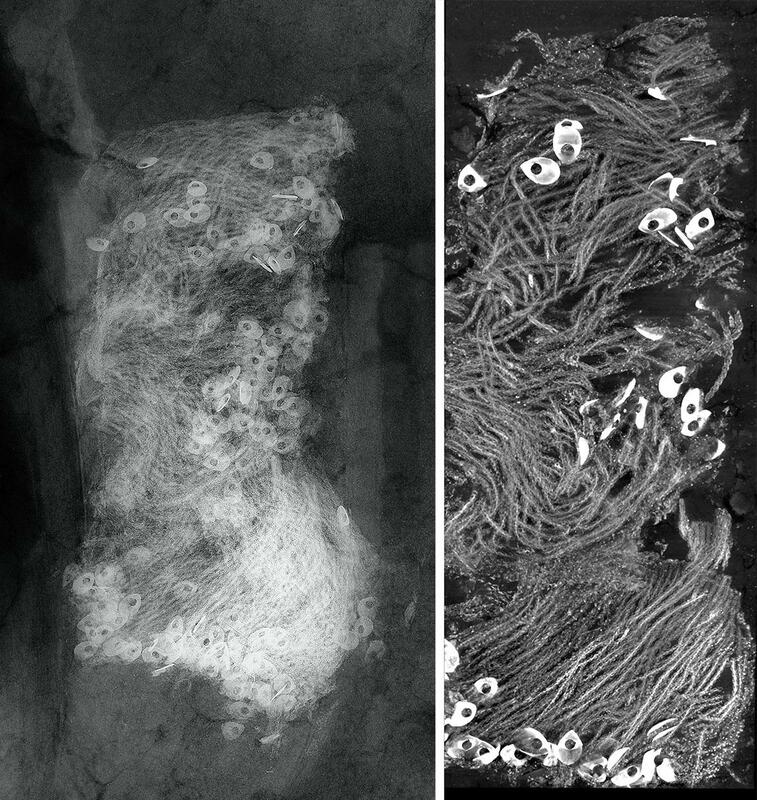 X-ray (left) and micro-CT imaging of the silver fringe found with William West. How did the men die? Was there anything else I could get a reporter’s lead on now that I had these charming head honchos on the phone? “Do you know about climate change and how it is affecting the site?” Horn asked. 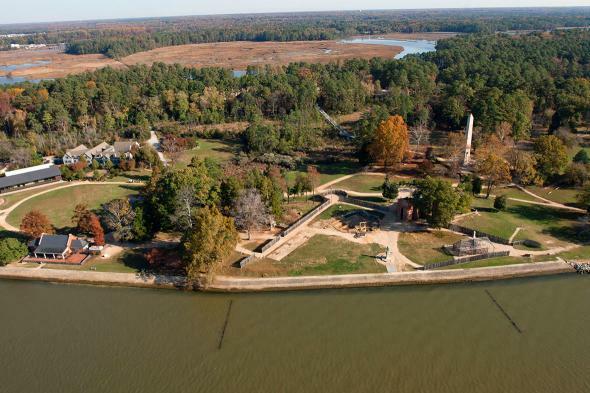 Aerial view of James Fort, Jamestown Island, Virginia. There is nothing like talking to a person who loves his work. I was excited all over again. I asked Kelso: Bill, do you ever lose yourself to history? Are you ever in the field forgetting what century it is? *Correction, Aug. 4, 2015: Due to an editing error, this story originally stated that a Pamunkey congregation this large had not gathered since the 17th century. 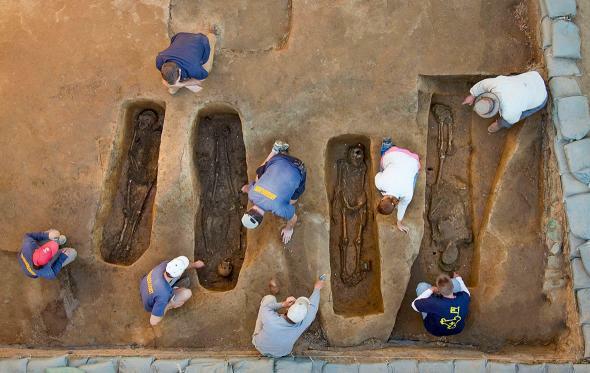 A group this large had not gathered since the 17th century inside Jamestown.